All athletes and sports enthusiasts understand the importance of sports mouth guards to protect their teeth and gums when engaged in any type of sport where contact with other players may lead to injury. 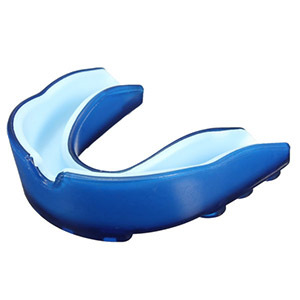 Sports mouth guards are manufactured from Ethylene Vinyl Acetate–EVA–which is a type of plastic that is tough and strong, and easy to mould into any shape desired. Ultimately, such a mouthpiece will precisely fit over your gums and teeth, where it will offer effective protection against mouth injuries. This includes trauma to the tongue, cheeks, lips, gums and teeth. Additionally, such a device also cushions any type of impact to your jaw, which may ultimately prevent neck and jaw injuries, and even damage to your brain. To ensure optimum protection, one of our gentle dentists in Point Cook will take impressions so that the guard will be a perfect fit for your mouth, gums and teeth. You will also be pleased to know that the procedure is not difficult: A mould of both the lower and upper teeth will be taken, then sent to a dental laboratory for the manufacturing of a customised guard. It is important to understand that over time, sports mouth guards sometimes wear out and need to be replaced. When you visit the dentist for a check-up, remember to bring the guard for an evaluation! (03) 9395 8400 to schedule a consultation about getting a sports mouth guard.